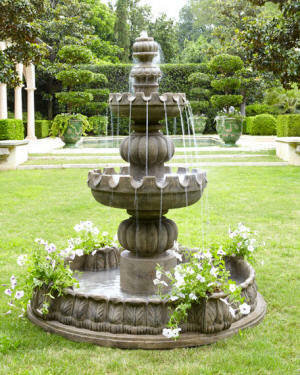 French garden accents in classical and country styles. Handmade ruffled planter. Made of crushed stone, polyester resin, styrene and fiberglass. 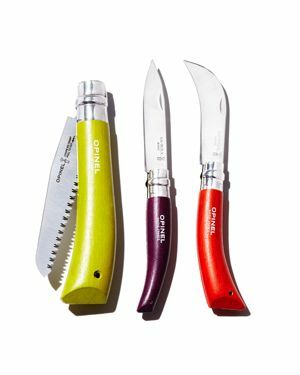 For indoor & outdoor use. A spherical hanging basket turned upside down sits atop a beautifully aged barnacle planter for a fresh take on container gardening. To get the look, simply pair a zinc sphere with a similarly sized planter and add a stand for height. We love a wild, natural planting to interact with the zinc sphere, but a minimalist approach is just as elegant. Both the zinc sphere and barnacle planter are durable enough for outdoor use. Add a little romance to outdoor floral displays with this charming wall planter. Andros Traditional Urn Planters Jeva Planter Global Views Lodhi Planter, 18"
Handcrafted traditional urn planters. Made of crushed stone/polyester resin/styrene/fiberglass. Lacquer finish will weather over time like carved stone. Outdoor safe; weather resistant. Ideal for small ornamental trees and shrubs, this oversized planter features golden stripes for a touch of shine. Planter made of polished stainless steel with oversized handles and hidden casters. Watertight. Crafted from durable cast stone material, stained to achieve the natural aged limestone look on the planters and the antique copper bronze for the planter box. Add form and function to your patio with this square planter embellished with a leaf-scroll design. An aged limestone and dark brown finish adds to its appeal. Made of lightweight and durable materials so you can easily move it around when you need to. Handcrafted of crushed stone, polyester resin, styrene, and fiberglass This unique planter with its open scrollwork base and acanthus-leaf decoration on the rims of each of the three containers showcases favorite florals and greenery perfectly. Made from durable fiber stone, this naturally aged urn is a coastal-inspired planter for patio container gardens. Lend a textured touch to your favorite plants with this woven rattan vessel. Gleaming copper trays paired with white earthenware containers are elevated by simple plant stands, for an unexpected and modern grouping for your most natural plantings. Crafted with classic English gardens in mind, this lattice teak planter makes the perfect home for topiaries, miniature trees, and vibrant florals. A basket weave pattern and intricately designed legs form a planter with plenty of room to grow. Handcrafted of lightweight and durable materials with a hand-applied lacquer finish Crafted with classic English gardens in mind, this slatted teak planter makes the perfect home for topiaries, miniature trees, and vibrant florals. Galvanized steel Ceramic. This piece is intended for indoor or outdoor use Made from simple, glazed earthenware, this indoor planter takes the shape of a vintage jug. Brightly colored wooden handles. Anti-corrosive properties with no special maintenance required. Made in France Stoneware Banded details accent this hand-crafted earthenware planter. Made from durable fiber stone, this graceful urn with a wide band at the mouth is a simple planter for patio container gardens. Made from durable fiber stone, this simple bowl offers a graceful, rounded shape for patio container gardens. Shaped from durable fiber stone, this graceful urn is bedecked with a raised, leafy garland. Made from durable, glazed stoneware, this urn planter is inspired by traditional, Provencal garden finds. Perfect for a planted centerpiece, this terracotta trough is accented with intricate diamond detailing. In a classic tapered silhouette with a ridged lip, this square metal urn adds sophisticated elegance to any indoor planting. Replicate the sound of a waterfall in your own backyard. 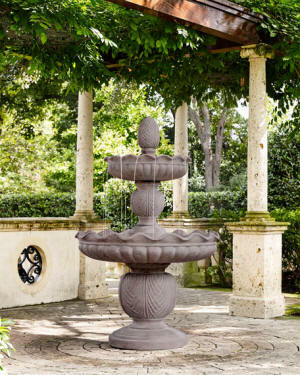 This stonecast fountain comes with a functioning submersible pump and auto shutoff feature. 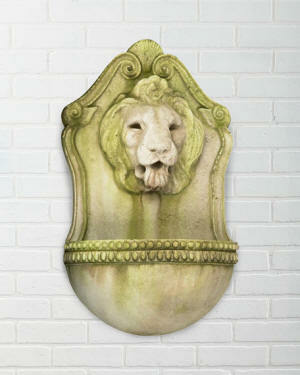 Crafted from durable cast stone material, stained to achieve the natural aged Terra-cotta look. Parts smartly constructed to allow for simple assembly. Fountain made of crushed stone/resin/styrene/fiberglass. Handcrafted granite finish that looks like carved stone. Initially, fountain may be lighter than shown here. 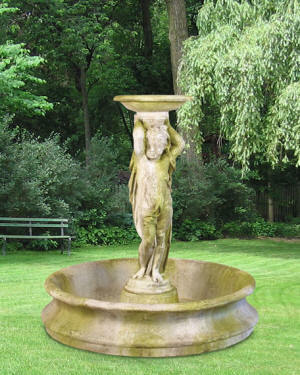 Over time in an outdoor setting, the color will fade as natural weathering takes over and gives the fountain its own patina. Outdoor safe. Handcrafted fountain. Made of durable, all-weather crushed stone/resin/fiberglass. Hand-painted lacquer finish. Handcrafted cherub fountain. Made of fiberstone. Lightweight and all weather durable. All finished will vary - designed to look old and antiqued. 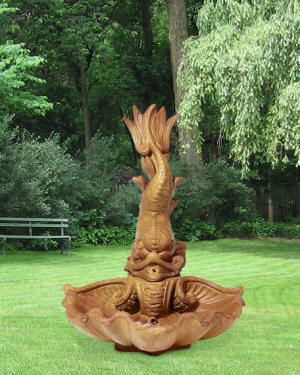 Handcrafted dolphin and shell fountain. Made of fiberstone. Lightweight and all weather durable. Handcrafted wall fountain. Made of fiberstone. Lightweight and all weather durable. All finished will vary - designed to look old and antiqued. 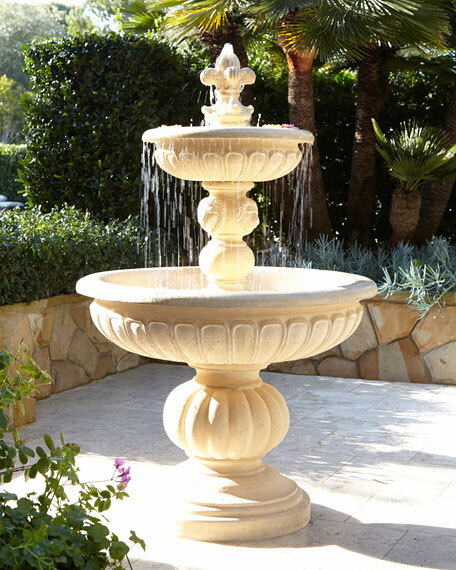 Handcrafted two-tier fountain. Made of fiberstone. Lightweight and all weather durable. All finished will vary - designed to look old and antiqued. This trash holder makes quick work of keeping trash out of sight. No one will ever suspect what this pretty piece's job is. Handcrafted of crushed stone, plastic and fiberglass so it is able to withstand the elements. Spring rod holds a standard kitchen garbage bag This waste bin looks so nice, you'll be especially happy to have it handy in the garden. Made of lightweight, durable blends of crushed stone, resin, styrene, and fiberglass with a lacquer finish Handcrafted stool. Made of fiberstone. Lightweight and all weather durable. All finished will vary - designed to look old and antiqued. Handcrafted scrollwork frame with round mirror center. Fiberstone frame. Lightweight and all weather durable. All finishes will vary - designed to look old and antiqued. Handcrafted wall décor. Made of fiberstone. Lightweight and all weather durable. All finished will vary - designed to look old and antiqued. Handcrafted mirror with cherub and floral carved frame. Fiberstone frame. Lightweight and all weather durable. All finishes will vary - designed to look old and antiqued. The mission style of the Hera clock will add an arts and crafts element to your home or outdoor living space. Handcrafted wall shelf with four hooks. Made of iron and tole. Topped with a wood finial. The country/cottage style of the Tree of Life thermometer will add a natural elegance to your outdoor living space. The Premium Capitol Mailbox Package with personalized side plaques and standard post; fashion and function with a classic design. A simple way to display your address, including street name, while enhancing the curb appeal of your home. The Premium Capitol Mailbox Package with personalized side plaques and standard post; fashion and function with a classic design. A simple way to display your address, including street name, while enhancing the curb appeal of your home The Ultimate Capitol Mailbox Package with personalized side plaques, door plaque, two-sided topper and newspaper box; fashion and function with a classic design. A simple way to display your address, including street name, and last name, while enhancing the curb appeal of your home. Woven from natural willow, we love this elegant, flared obelisk when paired with climbing vines or string lights. The Whitehall Monte Carlo personalized plaque adds instant curb appeal to your home address numbers. The Monte Carlo plaque features traditional styling and a simulated carved wood accent. Every Whitehall plaque is proudly hand crafted in the USA. The Roselyn Arch personalized plaque adds instant curb appeal to your home address numbers. A detailed scroll border frames the edge of the Roselyn plaques classic arch design The Whitehall Spring Blossom personalized plaque is a great way to add instant curb appeal. The Spring Blossom plaques classic rectangle shape is accented by a highly detailed tree in bloom. Every Whitehall plaque is proudly hand crafted in the USA. The Whitehall Penhurst personalized plaque adds instant curb appeal to your home address numbers. A detailed scalloped border frames the edges of the Penhurst plaques classic arch design. Every Whitehall plaque is proudly hand crafted in the USA. The Boston personalized plaque is a great way to improve curb appeal. The Boston plaque boasts a Mission Style border that adds character to its traditional rectangle shape. Every Whitehall plaque is proudly hand crafted in the USA. Add a unique, distinctive finish to your home while you welcome your guests with this Bless Our Home personalized plaque! This beautiful silhouetted Bird and Branch design with large ribbon shape welcomes friends to your home. Space for Family name and established date. Hanging hand-forged iron sconce. Bubble glass shade. Hanging hand-forged iron sconce. Glass walls. Hanging hand-forged iron sconce. Bubble glass shade. Hand-worked iron lantern sconce. Hanging hand-forged iron sconce. Glass walls. Hanging hand-forged iron sconce. Tapered glass walls. Outdoor lantern sconce made of cast aluminum and optical water glass. Hand painted with a two-step aged-bronze finish. Inspired by historic English Manor homes throughout the Southern region. Made of cast aluminum and designer water glass. Wall light inspired by historic English Manor homes throughout the Southern region. Cast aluminum and designer water glass. Outdoor lantern handcrafted of cast aluminum and seeded glass. Weather-resistant patina finish. Aluminum outdoor lantern. 12"W x 12"D x 31"T; backplate, 5.25"W x 23.5"T. Oiled-bronze finish. Lantern-style light made of metal and clear seeded glass. Oiled bronze finish. Ceiling fan specifically designed to make covered outdoor living spaces more comfortable. For use in covered areas outside; pretty enough to be used indoors, as well. Crafted of steel and wood with an aged bronze and walnut finish. Blades are hand scraped for nice texturing. A stately iron planter becomes a year-round fixture when topped with an illuminated garden structure. Affix a strand of Stargazer Globe Lights to the frame of a zinc Meridian Sphere, then fill the planter with a base of fresh-cut evergreen boughs and aged metal stems. Ceiling fan has metal frame, etched glass light cover, and ABS blades. 30"Dia. x 16.25"T; 26" blade span. Reclaimed wood finish. Three speed reversible motor. Handheld remote control included.